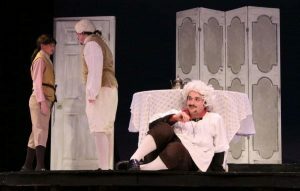 The Vincennes University Theatre Department will present “Tartuffe” this weekend at the Red Skelton Performing Arts Center. Program Chair for the Theatre Department, Kendra Clauser says the play and pokes fun at the leadership and aristocrats that once dominated French society in the 17-hundreds..
Clasuer adds there is a great deal of physical comedy in the play similar to what you might see on Saturday Night Live. 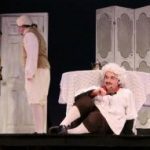 Performances of Tartuffe will be tonight and tomorrow at 7 pm and Sunday afternoon at 2 in the Red Skelton Performing Arts Center. Clauser says the show is suggested for ages 12 and up. Tickets are $12 for adults, $7 for seniors and $5 for non-VU students and can be purchased on line or at the Red Skelton Performing Arts Center Box office. Picture courtesy of Vincennes University Student News Publication: The Trailblazer.